I am up and at the gym by 5:30 most mornings. After a good workout, I dash back home for a quick shower and then zip off to work. Nope-no time for breakfast. But that is a huge mistake. We all know that. A healthy breakfast sets a successful eating pattern for the day, so we’d better make it a good one. That is a challenge on a tight schedule though. What is the solution? The Grab and Go breakfast. No-not the drive through kind, the refrigerator leftover kind. Here is how to do it. First, grab a couple of eggs because they offer excellent protein. Why does that matter? Protein can help stabilize blood sugar and keeps the hunger pangs at bay. You feel full longer. Eggs pack a quality nutritional punch, so feel free to grab 3 or 4 of them. Next grab the leftover quinoa with spinach and pimento that you made last night for dinner. Once you are at work, get situated. Check your emails, review your calendar, and fill your water bottle with refreshing ice water. Next, take your eggs and quinoa and find a microwave. Crack your eggs into a glass microwave safe dish. Include one or two whole eggs and one or two of the whites only. Most of the protein in an egg resides in the white so use all of the whites. Don’t be afraid of those egg yolks though-they contain beneficial vitamins and minerals like choline, selenium, and B vitamins like folate. Next, take a fork and whip up your eggs. If you are a milk drinker, add a few tablespoons to make your eggs fluffy. Add some pepper for a little kick. Pop it in the microwave. Try cooking your eggs in 30 second increments until almost done, stirring your eggs every 30 seconds. Next, add in your grains. This adds fiber, texture, flavor and a bit more muscle building protein. Finish cooking your eggs with the grains. So there you have it. You are having a delicious healthy breakfast at the office in a snap. This is how to do a healthy Grab and Go breakfast. And the best part is that this is very budget friendly because you used leftovers. Love that! What are you doing with your leftovers? Cold weather is soup weather. When the chill sets in, the soup goes on. I decided to try making a soup I had never made before. And I wanted to make it from scratch. My darling Denis talked about his sister Kathy’s Italian Wedding Soup. He remembered it being quite delicious. Decision made. Italian Wedding Soup has meatballs, so my first order of business after finding a recipe that I could start with (while making it my own) was to make meatballs. I used a couple of types of ground meat, bread crumbs, a beaten egg, and some italian seasoning. While some epicureans fry their meatballs, I bake mine. I cooked up a big batch so there were extra to put into the freezer for another day. While the meatballs were cooling, I assembled the rest of my ingredients. Cooked meatballs, chicken stock (both homemade and store bought), shredded carrots, celery, arugula and spinach, orzo, eggs, parmesan cheese, and finally salt and pepper were set to come together in one magnificent soup. The homemade chicken stock was loaded with succulent herbss-and would perfectly season the soup. Next I started chopping. I like everything ready when I begin making something, It just makes it easier to assemble. Just a little FYI…when I use celery in a recipe, I use both the outer stalks and the leafy insides. I don’t waste any flavorful tidbit when I cook. Next I sautéed the carrots and celery in a little butter. Then I added the stock. My first ever soup kettle of Italian Wedding Soup was underway. The tantalizing aromas floating through the house brought my darling Denis to the kitchen. One of the many things I love about cooking…the kitchen becomes an impromptu gathering place. The soup was bubbling away, and the scents wafting through the house made the frosty day outside fade away . Next, more building of the flavors when the chopped arugula and spinach went into the broth. Then it was time to froth up the eggs. When I add eggs to any recipe, they sit on the counter for about 20 minutes to come to room temperature before adding them to a recipe. Eggs work better in recipes when they are room temperature. After whipping the eggs, I stirred the soup and slowly drizzled the eggs in-they cooked slowly as they were added. The soup was coming together beautifully. The house was filled with the warmth of bubbling soup. In went the meatballs. They just had to be heated through and the soup was complete. Time to dig in! Freshly grated parmesan garnished the soup. Cripsy garlic bread completed the meal. While it was chilly outside, inside it was warm and oh so delicious. Soup lends itself to personal csutomization. It can be easily tailored to taste. Love pepper? Grind some flavorful heat into the soup. Want more veggies? Chop them up and toss them in. Is vegetarian soup your preference? Use tofu and vegetable broth. Easy Peasy. Let your food express your personality and have fun! Superfoods! First we covered cabbage, and now the avocado. I am confident that you have embraced that superfood, and are ready to add another one into your diet. Ready? Here we go! Bonus…the next superfood is not a cruciferous vegetable, so no worries about the, ahem, gas issue. It is avocado. This is a fun one. Avocados, like cabbage, are a flexible food and super easy to prepare. An avocado has about 4 grams of protein per fruit and is low in sugar. Plus, they are rich n vitamin k, b vitamins, and have more potassium than a banana. Still need convincing? Consider that an avocado also contains half of the daily recommended amount of fiber, about 11 grams. (Okay, so maybe the fiber may be a bit gas producing, but you gotta consider the benefits and not just the…uumm…possible farts). This is a nutrient dense food. 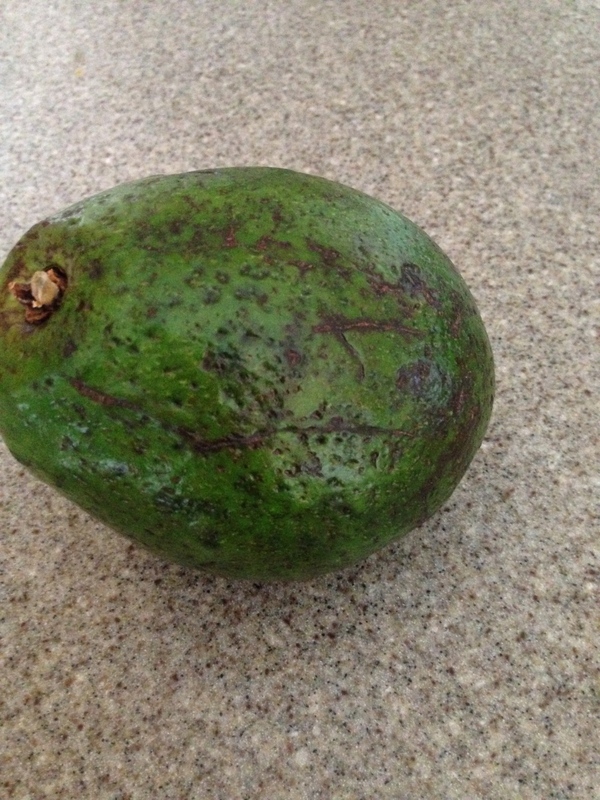 This Florida avocado graced my kitchen (although not for long!). Ugly but delicious! Some folks shy away from this powerhouse fruit because it contains fat. True, it does, so adding it in the diet needs to be in moderation. But the fat in an avocado is monounsaturated, the “good” kind of fat. This fat can actually lower cholesterol, some studies suggest. So indulge. When shopping for avocados, do not be deterred by ugly fruit. I actually prefer ugly fruit because it is less processed or sprayed than pretty perfect fruit. Go with an organic avocado if you can afford it. And check for ripeness. The avocado is ripe when is gives slightly to pressure. It should be a bit soft. Choose a softer avocado if you want to use it right away. If it will be in your fruit bowl for a few days, then opt for a more firm fruit and give it time to ripen. What to do with an avocado you ask? The easiest thing to do is cut it up and eat it. Or layer it on a sandwich. Or dice it up and toss it in a salad. Avocado’s are delicious any way you eat it. I had it for breakfast one morning for a powerhouse post workout meal. How? I turned the oven to 375 degrees. I sliced an avocado in half and took the pit out. Then I added a raw egg to the “divet” where the pit was. Yup. Sure did. Then I put it on a baking sheet into the oven while I showered. After about 20 minutes the egg was cooked in the avocado to perfection. I pulled it out of the oven added some low fat cheese, then popped it back in the oven for a few minutes. Voila! A breakfast packed with nutrients, protein, and flavor. Treat avocados like a baked potato and load ’em up! My baked avocado breakfast. So flavorful and nutritious. A fantastic post workout breakfast. Whats next? Predictable but never to be overlooked, the avocado is the star of guacamole. If you have the fixings, making guacamole is a must with any avocado. And it is so simple. Lime, tomatoes, cilantro, and maybe some hot peppers if you are adventurous . Thats all you need for great guacamole. One of the best things about making this is that it is totally customizable. You can make it as spicy, as creamy, or as chunky as you prefer. 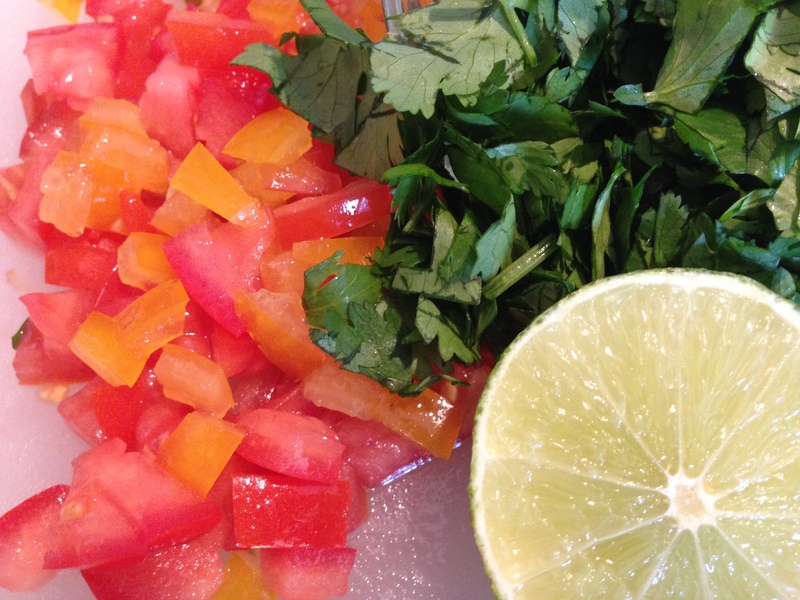 Stir in lime, cilantro, and tomatoes to avocado. Nothing short of delicious! If you want a quick guacamole, you can do that too. Mash up fresh avocados, add some salt and pepper, and squeeze a fresh lime over it. Since you are in a hurry, stir in your favorite salsa, and you are done. Then load up your chip, your taco, or spread it on your sandwich. Fresh guacamole! Fabulous and flexible! When making anything with avocado, keeping the pit in it, such as in the guacamole, keeps it from turning brown. So does adding a bit of lemon or lime juice to it. Either way, enjoy this fantastic nutrient packed superfood in many ways. Let me know what you do with your new superfood! Breakfast. What does it mean? When we sleep, we are fasting, meaning we do not eat. Breaking the fast, or breakfast, is the first meal of the day. We are often told that breakfast is the most important meal of the day. This is a topic of great debate in nutritional circles and beyond. As for me, well, it’s not a meal that I skip. There really isn’t uniformity with breakfast. Depending on lifestyle, culture, socioeconomic status, and time constrains, breakfast food varies. If I have a morning workout, a protein packed breakfast is my go to choice. If it is a lazy weekend morning, a chewy toasted bagel and some fresh fruit can be wonderful. And, of course, if there are leftovers around, those also work at times. Since I like to eat regionally, I enjoy all meals that reflect the personality and culture of the surroundings. Recently I was in Scotland. The food was spectacular. And the breakfast was not only filling, but a very interesting combination…and one that I would not have put together. But I loved it nonetheless. 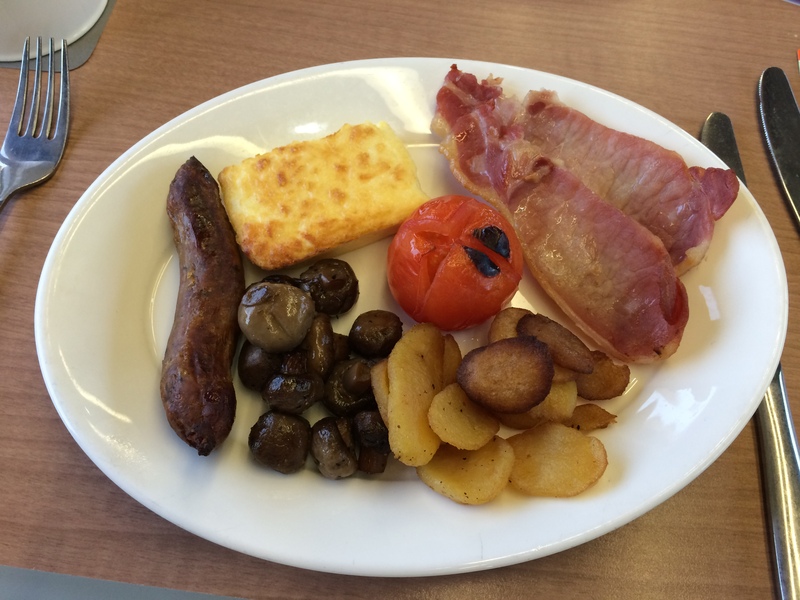 As my beloved partner Denis and I steeped ourselves in the people, history and food of Scotland, we noticed that this breakfast was pretty much a staple in every region of the country. The flavors varied slightly, reflecting the region of the food, but when we ordered the “standard” breakfast, it was consistent. Breakfast consisted of bacon (it looked and tasted like ham to me, but it was called bacon), potatoes, an egg, a roasted tomato, sautéed mushrooms, and a sausage. A basket of breads also accompanied the plate. Sometimes beans and back pudding were present too. This meal started us off on the right foot. Daily breakfast left us with a full belly of warm food on which to set out for the adventures that each day held for us. Breakfast was sustaining, culturally reflective, and delicious. So the next time you are off on travels, depart from your comfort zone. Be open to local culturally rich experiences, including culinary. Break your fast in the way that is right for you, but notice local flair. Scotland held many delights along our travels, and breakfast each morning started our day off just right. Go out there and have fun. Let me know what you find. How are these items related? Quinn: Why do we only have hard butter in this kitchen? Me: Because it is real butter and healthier for us than margarine. Quinn: But I can’t spread it for a grilled cheese sandwich! Ugh! Stupid butter! Me: Heat the pan up, melt the butter, and grill your sandwich that way. Quinn: Why can’t we just have the spreadable tub stuff? Man! (insert a sarcastic cough/snort here). Fast forward a couple of days. I was chatting with a friend that happens to be an executive chef. Me: My son was all ticked off because we didn’t have spreadable margarine for his grilled cheese sandwich the other day. David: Just use Mayonnaise. Its oil and egg. And it makes a great grilled cheese. Me: Do you mean use mayonnaise instead of butter on the bread grilling side? Oh yeah, this sent my mind spinning. It made sense. Mayonnaise is oil and egg. So maybe, I thought, the grilled cheese would end up with a little “french toast” essence to it. As far as chefs go, David has a fabulous palate with an opinion that I trust. I couldn’t wait to try this! Friday rolled around. I grab a quick dinner on Fridays because my son is an athlete that plays varsity football on Friday nights in the fall. I rush home from work, have a quick bite, and head out to the game. It was the prefect time to make a quick grilled cheese sandwich before heading out. It was time to go rogue! 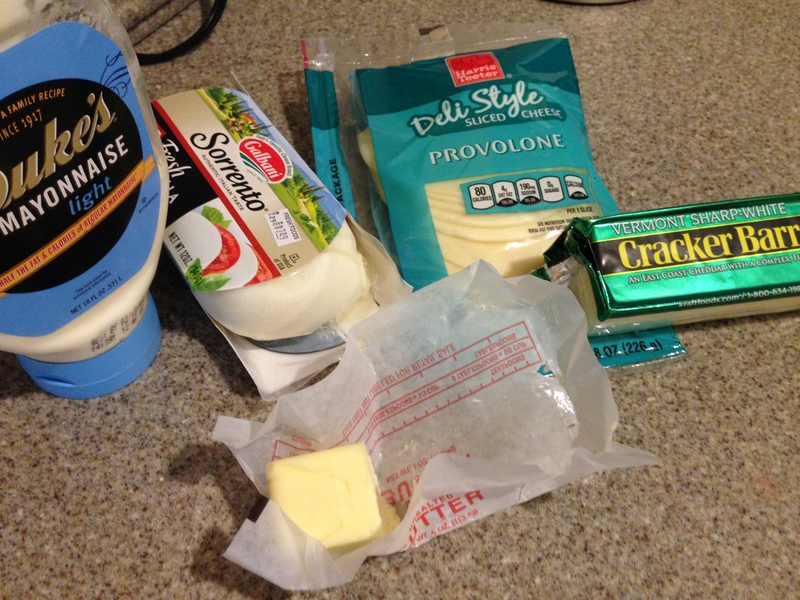 Taste test in the making…one grilled cheese with butter and one with mayonnaise. Yup. I was going to try it. I used the same pan, the same heat, the same bread and the same cheese on both sandwiches. This had to be a true side by side taste test. The results: Both cooked up in about the same amount of time. Both sandwiches browned nicely, and had a crisp outside bite with a creamy inside. Surprisingly, the sandwich with the mayo on the grilling side was the favorite. It had a “cheesier” flavor than the grilled cheese with butter. At first look at the picture in this blog, the food items do not look related. But they are. Try this. Let me know what results and preferences come out in your household. It is fun to experiment with food! Since that post, I am confident that you have embraced this superfood, and are ready to add another one into your diet. Ready for another super food to try? Here we go! Bonus…the next superfood is not a cruciferous vegetable, so no worries about the, ahem, gas issue. It is avocado. This is a fun one. Avocados are, like cabbage, a flexible food. It is also super easy to prepare. An avocado has about 4 grams of protein per fruit and is low in sugar. Plus, they are rich n vitamin K, B vitamins, and have more potassium than a banana. Still need convincing? Consider that an avocado also contains half of the daily recommended amount of fiber, about 11 grams. (Okay, so maybe the fiber may be a bit gas producing, but you gotta consider the benefits and not just the…uumm…possible farts). Anything with avocado is terrific in my book. When shopping for avocados, do not be deterred by ugly fruit. I actually prefer ugly fruit because I feel like it is less “processed” or “treated” than pretty perfect fruit. The avocado is ripe when is gives slightly to pressure. It should be a bit soft. Haas avocados are smaller than other avocados, but I like them all. This is a Florida avocado. A recent avocado that graced my kitchen. Ugly but delicious! What to do with an avocado you ask? The easiest thing to do is slice it up and eat it. Or layer it on a sandwich. Dice it up and toss it in a salad. I had it for breakfast one morning for a powerhouse post workout meal. How? I turned the oven to 375 degrees. I sliced an avocado in half and took the pit out. Then I added an egg to one half where the pit was removed. Yup. Sure did. And I put it on a baking sheet into a hot oven while I showered. After about 20 minutes the egg was cooked in the avocado to perfection. 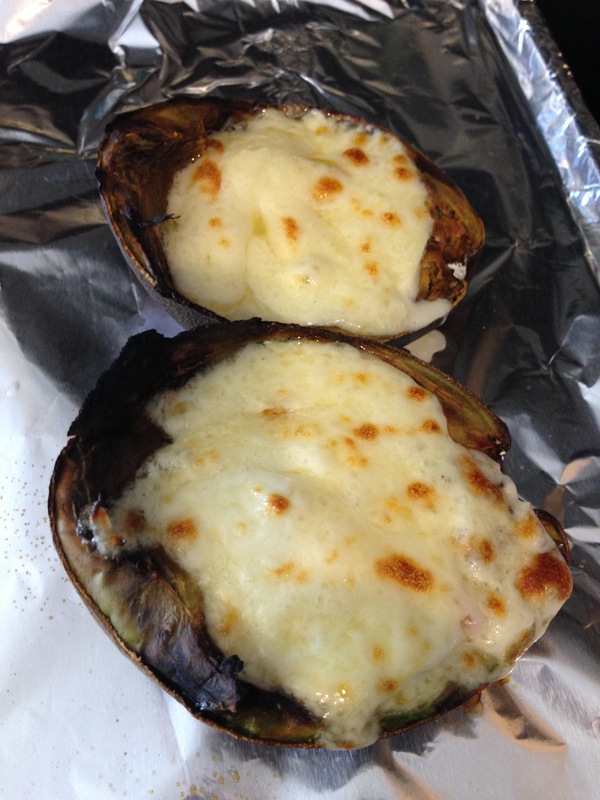 I pulled it out of the oven added some low fat cheese, then popped it back in the oven for a few minutes. Voila! A breakfast packed with nutrients, protein, and flavor. I treat avocados like a baked potato sometimes. Load ’em up! Whats next? Predictable but never to be overlooked, the avocado is the star of guacamole. If you have the fixings, making guacamole is a must with any avocado. And it is so simple. Lime, tomatoes, cilantro, and maybe some hot peppers if you are adventurous are all you need for great guacamole. One of the best things about making this is that it is totally customizable. You can make it as spicy, as creamy, or as chunky as you prefer. The moanable moment is in the “add ins”, such as hot peppers, onions, or sour cream.Let me show you my guacamole. Start with mashing up an avocado and add just a few things. Then load up your chip, your taco, or spread it on your sandwich. 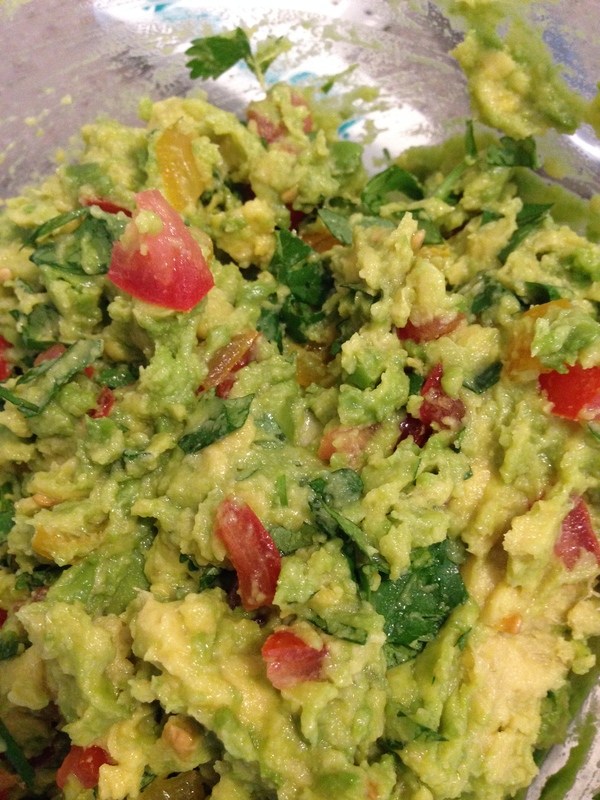 Stir in lime, cilantro, and tomatoes to mashed up avocado. Nothing short of delicious! When you are in the kitchen with your family, talk about nutrition. These discussions need to be done with a little strategy. Children cannot be barraged with information. It will sound like lecturing, and the “off” button will be activated in your child. Think of your conversations being constructed with bullet points. Brief. Light. Just the highlights. Discussions such as these can be easily conducted while working on getting a meal to the table. 1 ounce of meat (protein) is about the size of your thumb. 4 ounces is an appropriate serving and about the size of a deck of cards..
1 egg or 2 tablespoons of peanut butter is about an ounce. One serving of bread is usually 1 slice. Fruit juice can generally count as 1 fruit serving a day. In other words, 2 glasses of fruit juice isn’t 2 fruit servings. And remember, high quality fruit juice is worth the extra expense. A vegetable serving is 4 ounces. That equals a half cup. A serving of milk is 8 ounces. That is one cup. One serving of Grape Nuts cereal is 4 ounces. That is 1/2 cup. Are these serving sizes surprisingly small? This briefly illustrates how out of control portion sizes have become acceptable in our diet. The expectation has changed to a “bigger is better” mentality with food. Portion size is included on the packaging of most food, but consumers fail to use this tool. Hey, I get it. Being in the grocery store juggling kids, a list, and playing beat the clock is rough. Not a great time to stop, read and analyze a label. How do we combat this? Start by standing at your pantry or food cabinet at home. Education can begin at home. When time isn’t so tight, take a minute or two to look at the food you have in your cupboard or pantry. This is a great time to read the labels and start to formulate a healthy portion control plan. Start looking on food packaging for portion information at home, not at the store, and share it with your children. It is a great habit to get your family into, and a good way to have discussions about portion control. Talking of portion control, I do not allow my family to eat out of a bag of chips, for example, when snacking, They must pour their snack into a bowl. I expect this for a couple of reasons. The first reason is simple cross contamination. I am a clinical nutrition professional, so food safety is always on my mind. It just isn’t healthy to put your hand to your mouth and then place that hand back into a big bag of snack food. The second reason to portion foods, including snack food, is for control. You just don’t know how much you are eating when not portioned it out. And I think to learn self control, eating a certain portion raises awareness. “Mindless eating” is eating without being conscientious of what you are eating. Portioning your food helps eating be more mindful. I am also a fan of eating meals att the table and on a schedule when possible. It is important to enjoy meals with music on, with others, and making it a social event when possible. If eating alone, I still think ambiance and environment are important. Eating at a healthy pace, sipping water or other healthy beverage, and having conversation is a way to slow down eating. The body signals when it is full, but you have to give those signals time to get front he stomach to the brain! Portion control is important, as is variety and physical activity. It is important, though, to start with one small step, one small change. Next start walking after dinner! Another small change with a big impact!